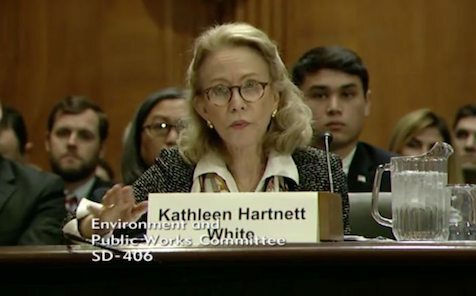 WASHINGTON – The Trump White House confirmed over the weekend that it was withdrawing the stalled nomination of Texan Kathleen Hartnett White to head the Council on Environmental Quality. White, formerly chairman of the Texas Commission on Environmental Quality, the state’s pollution-regulating agency, was nominated in October 2017 to head the CEQ, which acts as a White House gatekeeper for many environmental policies and projects. She had even been confirmed by a 11-10 party-line Senate Environment Committee vote in November. But White’s longstanding doubts about climate science and lack of certainty about the facts of that science during a confirmation hearing drew intense opposition from scientists, environmentalists and Democrats. She was facing an uphill climb in the closely divided full Senate. Several Republican senators declined to commit to voting for her. With Republicans now holding only a 51-49 edge after Alabama Democrat Doug Jones’ December election, her nomination appeared to some observers last month to be in possible jeopardy. The Washington Post, citing unnamed sources, first broke the story that the White House would withdraw the nomination late on the afternoon of Saturday, Feb. 3. But the story was quickly confirmed by Greenwire, the New York Times, and the Associated Press, among others. The White House eventually said that White was withdrawing her own nomination. As a fellow at the influential Texas Public Policy Foundation, a conservative think tank in Austin, White has been a steadfast promoter of fossil fuels. Overall, [she] recklessly dismisses the threat that global climate change poses to our nation, and to humanity, and she should have no place at a federal environmental regulatory agency. A federal failure to prepare for the effects of a warming planet, and refusal to reduce carbon emissions, will put Texans at greater risk of falling victim to natural disasters. Joseph A. Davis is the Washington correspondent of Texas Climate News.